Bridge Faucet. 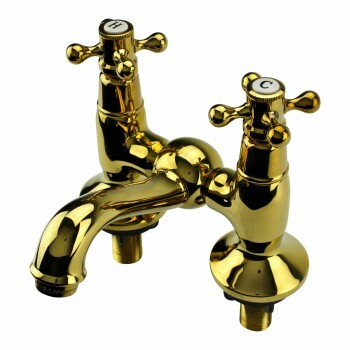 PVD Solid brass cross handles and single spigot 5 in. high, projects 5 in., 2 1/2 in. diameter base bellsd. Ceramic washerless. Ceramic washerless valves. Pull out plug not included, we suggest item 98915 or 98916. Does not include pop-up drain. NOTE: May require 4 inch centerset plate or sink hole plug for installation on 4 inch centerset sinks with 3 faucet holes, not included. This faucet is NOT compatible with Portsmouth and Cloakroom sinks.